Always alert with its upright ears and attentive expression, the Australian Silky Terrier has a mixture of temperament traits, showing all the determination and enthusiasm of its terrier ancestors. Vivacious, intelligent and somewhat mischievous, the Australian Silky Terrier dates back to the 19th century when it was known simply as a Rough or Broken-Coated Terrier. The breed is the result of crosses between various larger British terriers including Paisley/Clydesdale (now extinct), Dandie Dinmont and Skye Terriers, and later with the Yorkshire Terrier, which contributed to the silky coat and small size of the Australian Silky Terrier that we see today. Due to the prominence of the breed in Sydney, it was originally also known as the “Sydney Silky”. However, Victorian and Tasmanian breeders also laid claim to the origins of the breed so, in 1956, the official name, Australian Silky Terrier, was adopted. Full of energy, the Australian Silky Terrier isn’t your typical lap dog and doesn’t like to be fussed over. Rather, it prefers to be treated as an equal. If exercised daily, this breed is suitable for apartment living but is also ideally suited to suburban family life, usually devoting itself to one particular family member (often the person who feeds it). Their small size makes them great companions for children (although PETS recommends supervising children with dogs of any breed). They are the perfect size for any backyard and are just right for those family outings in the car. Assertive and extremely brave, the Australian Silky Terrier has strong guarding instincts and will often attempt to take on much larger dogs than itself. In the 1970s, the breed developed an erroneous reputation — through irresponsible breeding — for incessant barking, but this characteristic has been adjusted. Versatile and hardy, the Australian Silky Terrier has a single coat that is long, soft and, as the name implies, silky. The coat is the same texture as human hair so doesn’t need a lot of maintenance. They love a good brush, and light grooming around the eyes, ears, muzzle and under the tail is all that’s needed. Due to their single coat, they don’t have a strong doggy odour and they don’t shed much hair, making them ideal for people with allergies or asthma. Helen Arkley of the Australian Silky Terrier Association of NSW has been a breeder since 1971. She started out with a Silky cross and was drawn to the breed’s vitality, intelligence and easy maintenance. 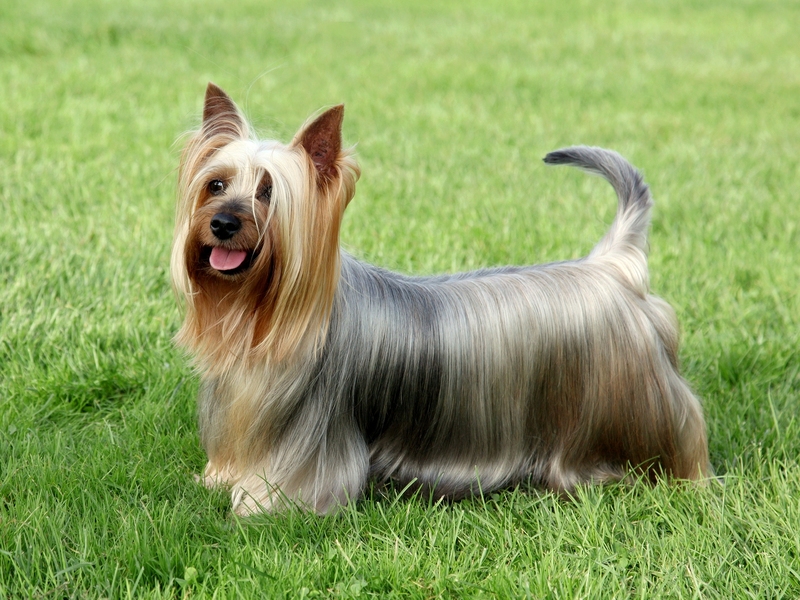 Helen recommends the Australian Silky Terrier for younger people because of the breed’s energy levels. “They can be a little too boisterous for older people because of their vivacious energy. They’re inclined to want to jump and run and therefore don’t normally match the energy levels of older people,” she says. Helen adds that the breed is also very good with children and recommends them for families. “They love to play ball and have heaps of energy, so they’re good with children. They will play ball with the kids until the kids drop and they will still want to keep going,” she says. According to Helen, the Australian Silky Terrier is a very adaptable, all-round breed and will live indoors or outdoors anywhere, from a one-bedroom apartment to hundreds of acres. They are versatile, low maintenance and good at hunting rodents on the farm. The Australian Silky Terrier is a sturdy little dog with no inherent eye or heart problems. 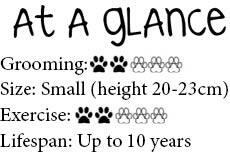 “As they get older, they age the same as any other dog,” Pat says. She advises anyone interested in this lovely breed to visit a registered and qualified breeder. For more information on the Australian Silky Terrier or to contact a local breed club, visit your state canine council website via ankc.org.au. New Zealand readers can visit nzkc.org.nz for information.